It’s high-time for another installment of ‘Desmond’s Quotes’, and this one’s a bit unusual. This post features performances taken from radio broadcasts of the Dave Brubeck Quartet at the Blue Note in Chicago, Illinois. Recorded in March of 1953, these recordings find the group on fire, Paul Desmond especially so. Aside from showing his tasty saxophone and fantastic musical prowess, they also reveal that he had something -or someone- on his mind. I already wrote about two other songs from this gig in other installments of ‘Desmond’s Quote’s’. One of those performances, “The Way You Look Tonight”, had a magical backstory that you can read about here, but for the sake of continuity, I’ve included that performance here as well. The other performance (read it here) had a lot going on as well. To the music! The audio quality isn’t perfect but it perfectly captures the energy and drive on display that cold night. Desmond was ‘on’ that night, fresh from his stellar performance at Oberlin College in nearby Ohio and ready to play. And play he did. 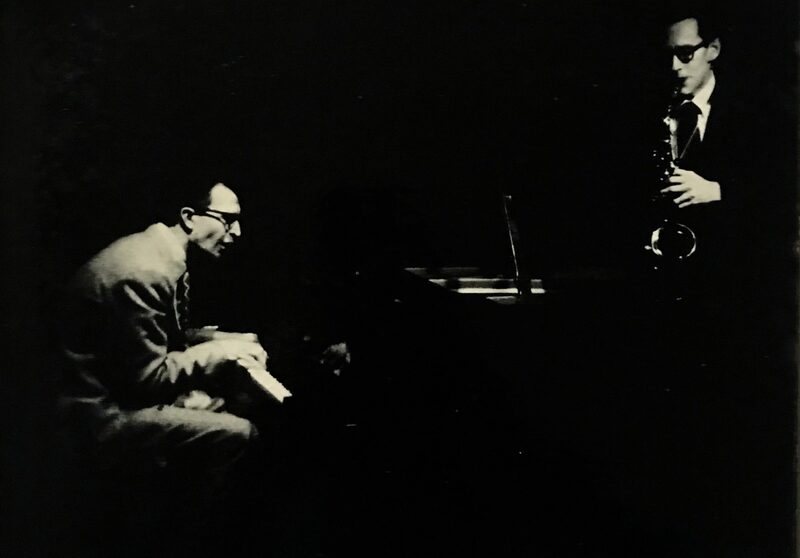 With Brubeck’s enthusiastic piano accompaniment, Desmond was spurred to play some tasty sax while stitching a story together with his use of inserting other tunes into his solos, or at the very least indicating what he was thinking about. One of the cool things about these recordings is that they aptly show how Desmond could and would use a quote from a song and fit it in different songs. Quite an impressive list. To understand the significance of the two Caroline-themed tunes used by Desmond, a quick backstory. In 1952, Desmond met a young couple of jazz fans during a swing through the East Coast. Their names were Arnold and Caroline Roth, and they became good friends with Desmond and Brubeck. 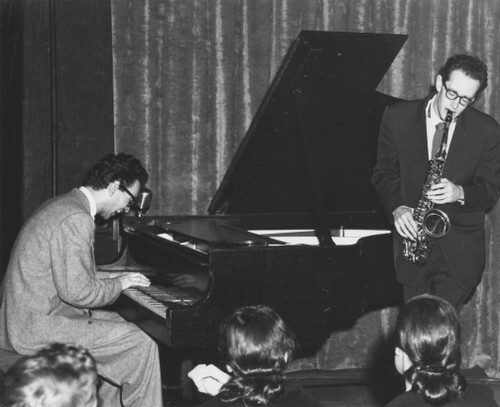 Late one night in March of 1953, Mr. Roth was fiddling with his radio in an attempt to find some live jazz, and happened to stumble upon a live broadcast of the Dave Brubeck Quartet in Chicago. At around the same time that he found that station, Arnold and his wife heard Desmond slip some quotes into his solo, most significantly “Can’t You Hear Me Calling, Caroline?” and “Buzzy”, played in memory of them. As if that wasn’t an unbelievable example of luck, that exact radio broadcast was taped and fifty years later released to the public. It’s that radio broadcast that these three performances come from. After I discovered those quotes in “The Way You Look Tonight”, I began to pay close attention to the other tunes, and sure enough, they were loaded with the same as well as different quotes. “Can’t You Hear Me Calling, Caroline?” was an old song in 1953 when Desmond used it in his solo, yet he knew it well enough to fit it in not once, but twice. It appears on “Too Marvelous For Words” and “The Way You Look Tonight”. Another quote pointed at Mrs. Caroline Roth was “Carolina In The Morning”. With a lyric that reads “Nothing could be finer than to be in Carolina in the morning”, this was a rather risque choice for Desmond to quote, but in Desmond’s mind, the connection made logical sense. Desmond must of been fond of this particular song’s melody, as it appears three times in each of the performances highlighted above. Each time Desmond uses it, he makes it work perfectly in relation to the shifting chords and varying keys of whatever song he’s soloing on. Despite actively and successfully avoiding the process of becoming a Charlie Parker sound-alike, Desmond loved and respected Parker and was a fan of his music. This appreciation was made clear that night through Desmond’s “Buzzy” trifecta. “Buzzy”, an original blues written by Charlie Parker, crops up a whopping four times in all three performances! Desmond was apparently a fan of the blues’ simple melody. This was one of the quotes Mr. Roth identified from Desmond’s solo. During their triumphant concert at Oberlin a few days earlier, Desmond used “The Lady Is A Tramp” in his solo on “The Way You Look Tonight”, and he repeats that again here, playing it an octave lower and more completely, much to Brubeck’s glee. It’s a lighter and more fun moment in the music-making process of Brubeck and Desmond. Later on in the tune during the improvised counterpoint, Desmond uses a section of the melody from “Ipca”, a little-known tune from the Dave Brubeck Octet’s songbook, which Brubeck quickly takes up and turns it into a fugue. Before we get into the significance of the quotes, let’s recap. On the quartet’s performance of “Too Marvelous For Words”, Desmond quotes “Buzzy”, “Can’t You Hear Me Calling, Caroline?”, and “Carolina In The Morning”. During Desmond’s solo on “Somebody Loves Me”, he weaves in “Carolina In The Morning” and uses “Buzzy” twice, in different parts of the song. Finally, on “The Way You Look Tonight”, Desmond again throws in “Buzzy”, “Can’t You Hear Me Calling, Caroline?”, and “Carolina In The Morning”, in addition to “The Lady Is A Tramp” and a snippet of “Ipca”. Quite an impressive performance. So what’s the significance? What’s going on here? A quick look at the tunes Desmond quoted reveals a tentative theme that may indicate what was thinking: Caroline, women in general, and Charlie Parker. It would appear that he had Mr. and Mrs. Roth on his mind, specifically Mrs. Caroline Roth with the numerous ‘Caroline’-themed tunes and the frequency in which he used them. His liberal use of “Buzzy” indicates his fascination with Charlie Parker that night. I wonder what was happening that made him use that particular song over and over? As for the “Ipca” quote, he reached back for that one. The Brubeck Octet last recorded in 1950, and that was when they recorded this tune, written by one of the guys in that group. It’s likely that nobody but a die-hard Brubeck fan would’ve caught that little snippet when Desmond and Brubeck used it for their Bach-meets-jazz explorations that night. At the very least, what these live recordings amply show is the high level of musicianship, humor, and pure fun that flourished in the Dave Brubeck Quartet, and how those qualities could manifest themselves over the span of a set. They also point to the musical mind of Paul Desmond. What do you think he was trying to say with his quotes? Here are the different tunes Desmond quotes from. Give them a listen, then see if you can find them in the performances from Brubeck’s live set above. Good luck! Side-note: I used versions with words, to better appreciate the potency and humor behind Desmond’s usage of those songs. As for “Carolina In The Morning”, Mrs. Roth told me that Paul Desmond later told her he retired that quote as he eventually concluded it was too naughty! Were you able to find the quotes? If not, don’t despair. Here’s a rundown of where the happen in each song, in order! “Can’t You Hear Me Calling Me, Caroline?” happens almost immediately afterwards at 1:49. “Carolina In The Morning” shows up next at 1:54. A rapid-fire execution! “Buzzy” once again appears at 0:44. “Carolina In The Morning” happens almost exactly at the minute-mark. “Buzzy” shows up again at 3:19. “Buzzy” once again heads off the quotes at the 0:56-mark. “Can’t You Hear Me Calling, Caroline?” happens seconds later at the minute-mark. “Carolina In The Morning” shows up next at 1:12. “The Lady Is A Tramp” crops up at 1:52. “Ipca” first appears at 3:57, after which Brubeck copies Desmond and plays it again, touching off an amazing improvised fugue based off of this phrase between the two men, complete with spontaneous harmonization.